As any good steward of business will tell you that elimination and elevation are important factors in today’s market. As a quote said, “That means ending something and taking something you are currently doing and making it better.” After studying the habits of the Twitter and Facebook followers and looking at the YouTube episodes ratings, the decision has been made to complete the run of the Australian and Britain versions of Vote for the Girls. This is not due to financial problems, my ongoing gender transition, or poor ratings in case anyone is wondering. I will say too many restrictions and limits lead to that decision of which the pre-existing restrictions and limits were what caused yours truly go downhill after 2013. The first Australian season of my popular Vote for the Girls web site began on July 1, 2015 with The Voice Australia’s fourth season. Only two episodes were posted on the Vote for the Girls Australia YouTube channel. According to my resources, the pilot was hardly impressed due to a lack of live feeds from the Australian broadcast networks, unlike the American and British versions. Therefore, the Australian version of Vote for the Girls is on a one week tape-delay and airs at 5:00 AM Eastern (10:00 AM in London and 7:00 PM in Sydney). That was just one reason why I believe Vote for the Girls Australia wasn’t performing good. I can think of four other reasons why VFTG AU became my biggest flop in 14 years. If the Aussie site was performing better, then the site would have returned for a second season that would likely want to replace yours truly as webmaster and keep the site going. Based on the ratings and despite what will be a perfect season (as my pick of Ellie Drennan was declared the winner of The Voice Australia season 4, fellow transwoman Kathi Jameson’s pick of Emma Freedman broke an eight year curse on Dancing with the Stars Australia after it was announced that Freedman won over my final pick Matthew Mitcham and a good shot of becoming the winning moderator in the event should my picks of either Natalie Conway, Louise Adams, Michaela Baranov, Jess & Matt, In Stereo, or Cyrus Villanveva–the latter two are flex picks–win the seventh season of The X Factor Australia), it’s far more likely that I had predicted big things for the Australian and British equivalents of Vote for the Girls, very little subscribers on YouTube and followers on the Facebook and Twitter viewers are reported to have tuned in to the most recent updates. The British (or United Kingdom Version) is currently in its third series. Vote for the Girls UK will end in 2017 (pending renewal of The Voice UK). And I will confirm speculation is rife that Vote for the Girls Australia will not return for a second season, but I will confirm that Vote for the Girls UK will return for a fourth and final season pending on what happens with “The Voice UK” after that show’s fifth series. Vote for the Girls USA moderator Lanise White said to yours truly, “Ava, girl, you need to worry about those ratings in Australia and Great Britain! The American version is way better than the UK and Australia combined.” – telling this mogul that she needs to focus more on this transwoman’s efforts across the Atlantic and Pacific Oceans. But let’s face it, long ago, even before I launched “Vote for the Girls UK” in June 2013, there were signs that the British and Australian versions were headed in, shall I say, one direction: downward. What did I do wrong in Australia and the United Kingdom? I can think of several reasons where I think I went wrong. Hiring Karly Ryder, Jr.: Trash Tube fans rejoiced when they learned that the Purple vs. Pink rivalry of yours truly and Karly would appear on the Australian and British adaptations of VFTG. But somehow, that chemistry wasn’t there. To make matters worse, Australians confused Karly’s name with an “Australian Idol” alum by the same name of Karly Ryder. And when Karly’s last pick of Naomi Price did not make the The Voice Australia Grand Final, it was clear that her involvement just wasn’t going to work out, at least on the American and Australian versions. Deaths of Ariel Swaringen, Michelle Steele, Khayla Chow, Rhonda Rhodes and Nermal Everman: Ariel, Michelle, Khayla, Rhonda and Nermal were just as night and day with Nermal already a treasure in Muncie, Indiana, due to being the niece of Vote for the Girls USA moderator and my long-time closest friend Holly Everman while on the other hand, Khayla was just as passionate who was ready for a fight. But after Holly’s infamous “Bi-Black-Bimbo” remark on the American Version and the deaths of Ariel and Michelle in March 2014 in addition to what has since been reported to be a rumored lack of camaraderie with Tracia Ward, Nermal, Rhonda, myself, and Kendra Ray. Just a few weeks into the UK web site’s second series, Khayla was let go from both the American and British versions after I found out from a trusted source (which turned out to be Lanise White) that Khayla actually called The Voice UK 3 contestant Lee Glasson a “f**king d**k-head” upon the elimination of Rachael O’Connor and profiled The X Factor UK 11 contestant Kaleigh Manners as a transman. Khayla did not take the news well and attempted to gain access to the VFTG set by kicking into the door (that startled Tracia) and VFTG USA moderator Kymberly Alvaraz fatally shot Khayla on October 21, 2014 and was eventually found not liable. Whatever the reason, those deaths indicated that even early on, there was chaos behind the scenes of the American, British, and Australian adaptations of Vote for the Girls. Too Many Schedule Conflicts: It was never a good idea to try to schedule the debuts of both the Australian and British versions of Vote for the Girls around baseball season nor Back to School season in America. One night before the twelfth series of Strictly Come Dancing live shows began on the British version, a black woman (identified as Whitney) interrupted taping of the British adaptation of VFTG that was eventually shown in its entirety and I would eventually get four moderator victories as my Strictly Come Dancing pick of Caroline Flack won with fellow Strictly Come Dancing pick Frankie Bridge being runner-up as well as the Moderators’ Saves of respective X Factor UK 11 and The Voice UK 4 picks of Fleur East and Lucy O’Byrne. Whitney was later sanctioned, confronted and eventually let go at the end of 2014 for that reason and eventually gave the 3:00 PM Eastern slot back to the Zinn family. Ava Zinn Had Too Many Restrictions and Too Many Limits: The British and Australian versions of Vote for the Girls differed from the American version since London (England) and Sydney (Australia) are respectively five and fourteen hours ahead of Indianapolis. That would create a problem for the Australian version and not for the British version (unless you are willing to give up NFL football). It was never a good idea to even try to produce the Australian and British versions of Vote for the Girls in the same location in America. However, yours truly realized a major weakness with the Australian version from its debut, and I had Twitter for live updates and had to wait at least 24 to 48 hours for external feeds and coverage. During The Voice Australia’s fourth season on the Australian version of Vote for the Girls, only the battle and super battles results were shown on the VFTG AU YouTube channel on a one week delay, then suddenly interrupted, and then totally preempted, one the most important competitions: Dancing with the Stars Australia 15. Midway through the competition came the announcement that the rest of the season’s episodes would instead air at a later date. But, unlike the American and British versions that had live coverage (via Internet live stream), Vote for the Girls Australia could offer only limited recap coverage of the events, making spoilers impossible to avoid. The Aussie version has never really got off the ground. What Happens in America Does Not Always Happen in other countries: The American version of Vote for the Girls is definitely a successful franchise than than other countries. On the Swedish and Italian versions of Vote for the Girls, respectively known locally as “Rösta för Flickorna” (Vote for the Girls Sweden) and “Vota Feminilli” (Vote for the Girls Italy), those franchises are currently have yet to see a Vote for the Girls loss; hence, a perfect season (both have used the Moderators’ Save with the Swedish version the first to implement it)–and pretty much add Australia to Sweden and Italy as the only VFTG franchises to have never had a VFTG Loss. Thailand has not been successful though due to the Thai version (known as Vote for the Girls THAILAND) has only seen one victory with Maneepat Molloy, but the Thai adaptation was still totally out of its depth trying to get support for the female contestants on “The Star.” Apparently both the Australian and British adaptations of Vote for the Girls’ first competitions were “The Voice” with Ellie Drennan and Andrea Begley respectively won the fourth season of The Voice Australia and the second series of The Voice UK while the American version’s first competition was “American Idol” season 9 with Crystal Bowersox coming in second place but finally got its first victory with Melanie Amaro on the first season of “The X Factor USA.” Apparently beginner’s luck in Australia and Great Britain in no way prepared yours truly for a bad curse in the months that followed. The fact VotefortheWorst.com only competed against Vote for the Girls in the United States: Ava Zinn (yours truly) became a YouTube name thanks to THIS WEB SITE, so when the first Vote for the Girls UK YouTube episode debuted, in July 2013 and it was basically “too Americanized”, that seemed rather odd. And the fact that YOURS TRULY–AVA ZINN, the same transwoman who created the Vote for the Girls franchise and is currently selling the franchise worldwide as well as hosting (and also have a moderatror’s victory) the American. British, and Australian versions, would allow such a web series to run and compete against an anti-fan site just seemed good. People over Profits (Kymberly Alvaraz buying my virginity): Following my decision to auction off my virginity to eventual partner Kymberly at the end of the British version’s second series, I’d say I laughed all the way to bank and for love, but that would be an inappropriate turn of phrase, considering how completely un-emotive the British and Australian versions were compared to the American version, and occasionally filled in for me on the UK and Australian adaptations when I was unable to do so. All Kymberly brought to the the moderator panel on the Australian and British versions of Vote for the Girls was her name and her fame (as a former news presenter in Denver, Colorado). The now 48 year old’s glassy-eyed demeanor, and even greater lack of interest in my own Vote for the Girls picks undoubtedly contributed to the slump. All is not lost for the “Vote for the Girls UK” and “Vote for the Girls Australia” franchise, however. My Strictly Come Dancing (Dancing with the Stars UK) 12 pick of Caroline Flack is currently hosting The X Factor UK and my X Factor UK 10 pick of Samantha “Sam” Bailey is doing well. And of course, there’s always “Vote for the Girls USA,” where I may find the next Valerie Rockey, Cassadee Pope, or “flex pick” Nick Fradiani because IT IS MY SITE–Vote for the Girls–after all. But when 2017 comes around, there will sadly be no “Vote for the Girls Australia” nor “Vote for the Girls UK” for female vocalists fanatics in Australia and United Kingdom. So there will be speculation that they could watch yours truly swear and blow cigarette smoke when the uncensored American version is posted instead. 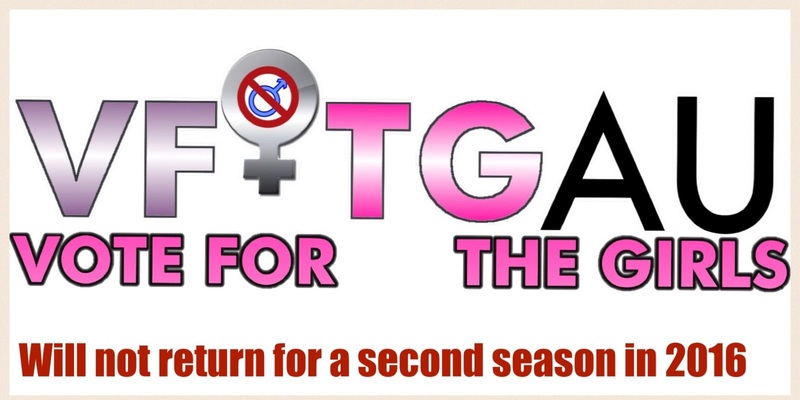 Vote for the Girls USA has been renewed for an eighth season. I have known something wasn’t right. NoSirGifts was playing hardball there. I know that was Jackson Steele’s fault since he took over as President and CEO. There has to be something done with the site and the rest of the AZH Venues. However kudos to Jack to keep the US version of the popular site.